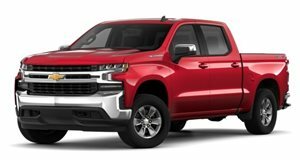 Chevrolet understands that a full-size truck is built to work, and has endowed the 2019 Silverado Crew Cab with more practicality than ever, offering both a short bed and standard bed. 2WD and 4WD derivatives are available, with a choice of engines from a 4.3-liter V6, rated at 285 horsepower and 305 lb-ft of torque, a 2.7-liter turbo-4 with 319hp and 348 lb-ft on tap, a 5.3-liter V8 with 355 hp and 383 lb-ft, and a 6.2-liter V8 delivering 420 hp and 460 lb-ft. The 4.3 and 5.3 units make use of a 6-speed automatic, with the 2.7 unit gaining an extra 2 ratios, and the 6.2 making use of a full 10-speed automatic. No fewer than 8 trims are available; WT, Custom, Custom Trail Boss, LT, RST, LT Trail Boss, LTZ, and range topping High Country, with prices ranging from $36,095 to $58,095 before options. What is there to say about a Chevy that hasn’t been sung by the music industry? Hip-hop loves 64’ Impalas and Biggie Small’s black Yukon from Tucson (that’s a GMC but it’s Tahoe enough for this comparison). Country sings a whole different tune, touting the Silverado as the best Chevy money can buy—a claim GM can back up by referencing its status as America’s second-best-selling vehicle. With a reputation to uphold and the company-wide apocalypse that would ensue if the newest Silverado doesn’t succeed, GM had to ensure the , now on sale as a 2019 model, improves on the truck it leaves behind without alienating loyal buyers. We asked Chevy to borrow one to see how the makeover went and was greeted one afternoon by a crew-cabbed batch of Cajun Red and chrome with a Monroney labeling it all as a armed with a 6.2-liter V8. Though the 2019 Silverado through the use of lightweight materials in the body and chassis, it doesn’t look a pound leaner. 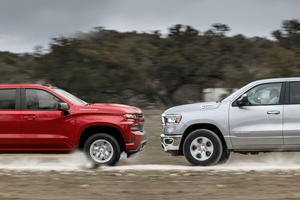 The large proportions publicized by its gargantuan chrome grille, which adopts GM’s latest styling language , kills any of the Silverado’s beach body dreams and love it or hate it, the Silverado’s new face trades the steely gaze of a veteran fire chief for the glare of an irritated Tonka truck. Squinty headlights and a Chevy Colorado-esque side profile up-sells the Silverado’s youthful nature, but its maturity never comes into question thanks to its big-boned body. On the other hand, the more design-oriented will likely focus most of their attention on the steel-toed-boot-friendly steps and the way Chevy integrated the dual exhaust tips into the chrome bumper. Aside from the exhaust, the ‘6.2-L’ badges on the hood are the only hint of the powerhouse that lies underneath. The EcoTec3 V8 is ferocious, playing its soundtrack out of the bumper-mounted exhaust and alluding to the 420 horsepower and 460 lb-ft of torque the engine splits among two or four wheels using a 10-speed automatic gearbox and four-wheel drive. The 10-speed shifts quickly and without drama, though not as seamlessly as the 10-speed in the . The powertrain’s biggest surprise comes when mashing the throttle hard. Given the pushrod setup, the 6.2-liter Silverado violently lays static inertia to waste while emitting bass-heavy exhaust notes. Like most pushrod engines, it doesn’t seek a red dot on the tachometer’s redline like a laser-guided missile, but the 6.0-seconds it takes to get from 0-60 mph is proof that high revs aren’t directly correlated with power delivery. That rings especially true when looking at the specs sheet, which reveals the 6.2-liter-equipped Silverado can tow 17,800 pounds and lug 2,000 pounds in the bed. Despite GM’s Dynamic Fuel Management system that lets the engine switch between 17 different firing patterns to use all eight cylinders less than 40% of the time, fuel economy is a losing battle when it comes to such a large engine, and the 6.2-liter V8 can only manage 17 mpg combined (16 mpg city, 20 mpg highway). 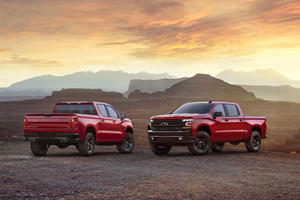 If you don’t tow frequently and can do with less power, Chevy offers five different engine options—two 5.3-liter V8s, one using a six-speed auto and the other with an eight-speed, a 4.3-liter V6 mated to a six-speed auto, a 2.7-liter turbocharged four-cylinder with eight gears, and a 3.0-liter V6 Duramax diesel, the only other engine that comes mated to the ten-speed. 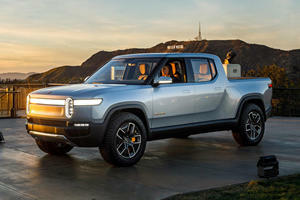 While the pickup market has always valued high amounts of customizability so every truck can be tailored to any job, the tsunami that has become the luxury SUV market has swept up America’s most popular segment along with the rest of the non-sedan herd. As a result, trucks can now be spec’d more luxuriously than ever before. LTZ used to be the Silverado’s highest trim until the High Country debuted in 2014. Unfortunately, we were underwhelmed by the 2019 LTZ’s cabin, even when it had the $2,350 LTZ Plus package added on. It’s not that heated and cooled leather seats, a plethora of tech toys and driver aids, and a power-lifting tailgate aren’t nice to have. It’s just that Chevy stuck too closely to the design of the old interior at the request of its more loyal customers, making the steering wheel, dash layout, and even the gauge cluster feel dated straight out of the gate. If you liked the old layout like most Silverado buyers apparently do, then you’ll appreciate the solid feel of the dash and buttons—even if they are made out of plastic—and the no-nonsense ergonomics of the cabin. Everything you need while driving is within reach and what isn’t can be found during a long stoplight or on the small-looking 8-inch touchscreen infotainment system. GM’s infotainment software has always felt lacking compared to Ford’s SYNC 3, but Apple CarPlay and Android Auto compatibility helps ease the auto industry’s inability to build software that users actually want to use. Barring the plain look of an all-black interior, the Silverado’s insides feel ready for work, adventure, or the plain old commute, especially when optioned with a personal WiFi network, folding rear seats for more interior carrying capacity, and storage cubbies up the wazoo. Plain or not, there’s no arguing that the interior of this Silverado feels much larger than before. With some configurations gaining 3.9-inches in wheelbase and growing longer by 1.6-inches, rear seat legroom can go up by 2.9-inches for a total of 43.8-inches. At the rear a high-strength steel bed floor 1.5-times stronger than the old bed is now 7-inches wider at the bottom, giving the Silverado best-in-class cargo volume. The new truck is also taller and wider, making it a chore to maneuver in cramped parking spaces (the rear-view camera and front and rear parking sensors are a boon here). One thing stood out about our tester was its height, which is enhanced by the Z71 off-road package. Option that and The General will lift your Silverado 2-inches before adding hill descent control, skid plates, meaty off-road tires, 20-inch wheels, all-weather floor liners, and a high-capacity air cleaner for a life on the trails. It was the inclusion of the Z71 package that altered driving dynamics most drastically on our Silverado when compared to the previous generation. After signing the paperwork required to borrow the Silverado for a week, we left the parking lot where we collected it in a huff—throttle pinned and engine blaring an anthem that could give turbocharged AMG engines an inferiority complex. Bounding down the freeway at speeds that can sway performance lovers into singing along to Tim McGraw’s “Truck Yeah,” the Silverado got its first taste of Bay Area lanes—riddled with imperfections and narrow enough that a wide truck drops the margin for error close to zero. That’s where things got white-knuckle scary. If automakers are searching for a way to get drivers to stop texting behind the wheel, the Z71 Silverado is it. High-travel shock absorbers and cushy springs help it feel composed on dirt roads at high speeds, but they make the Silverado feel freakishly uncomposed on the freeway. Steering is a bit too soft and has an on-center point too vague (partially because of those off-road tires) for inner city and freeway comfort, but we got the impression that the Z71 Silverado would be more than capable if tackling American roads and trails outside of the dense costal cities. For its tradeoffs, the Z71 package does enable supreme confidence when the conditions get muddy, snowy, rocky, or anything in between, and our inclination would have been to thrash the truck as if it were an (it almost has the horsepower for that job) if the aerodynamic flap on the bottom of the front bumper weren’t so danged low. We’d like to get behind the wheel of a non Z71 Silverado to see how mass-market models handle in day-to-day life, but it’s safe to say that if towing and long road trips are your main uses for a truck, save some cash and skip the Z71 badges. Going without the $2,345 Z71 package, unfortunately, will not save you a fortune. The total sticker price for our tester came to $58,630 including a $1,495 destination charge (shipping a 5,000-pound- truck with large dimensions ain’t easy) and a $1,000 discount on the Z71 and LTZ Plus packages. While base 4X4 LTZ costs $50,195 excluding destination, it costs $2,495 to upgrade to the 6.2-liter V8 (worth it if you’re a hooligan or tow on the regular), another $2,350 for the LTZ Plus package, $1,750 for a dealer-installed assist-step and tonneau cover, and $495 for the red Cajun paint in addition to the Z71 package’s price. As the rest of the competition does, Chevy makes it easy to tailor the Silverado to exact needs and budgets by selling it in eight trims. The bare minimum, a 2X4 Double Cab Silverado with the 4.3-liter V6, costs $33,695 including destination. Ascending the trim ladder from there and you’ll encounter the Custom, LT the sporty RST, the off-road oriented Custom Trail Boss, the LTZ, a higher level LT Trail Boss off-roader, and the range-topping High Country that starts at $58,095 including destination for a 4X4 Crew Cab with the 6.2-liter. One of the few features we felt was lacking for a Silverado commanding our tester’s price was automatic cruise control and a self-parking feature like the F-150 has. Aside from that the Silverado remains very much the truck it always has been, comfortable, capable, and easy to use for both professionals, weekend warriors, and truck lovers. But with a widening gulf in how each of America’s Big Three is tackling fuel economy, with Ford going turbocharged and aluminum while Ram , Chevy remains the truck maker that sticks to the classic recipe that’s made the truck America’s favorite vehicle….Even if the styling claims otherwise.